Raft fish the Legenedry Rangitikei River! A Trip of a Lifetime.....! No, there are no green trout - but your friends will be green with envy when you come home from an adventure in New Zealand's Rangitikei District with pictures of the beautiful browns and rainbows you caught! Jim Rainey has extensive knowledge of the Rangitikei river and its tributaries and will ensure your day is filled with as many fish as possible. Jim Rainey has been fly fishing for 30 years and guiding for the last 17 years. Trained under the guidance of Jack MacKenzie of Rangitikei Anglers Jim enjoys the opportunity to show visitors to the district the beautiful rivers we have at our back door. Sight fishing to browns and rainbows with a dry fly is the ultimate experience for Jim and he is very keen to take you to those fish. Jim is also a hill country sheep and beef farmer who guides through the summer season. Jim's specialty is Raft Fishing on the legendry Rangitikei River in search of it's big trout; a trip of a lifetime.....! Jim is a member of the NZPFGA (New Zealand Professional Fishing Guides Association), an association to advocate and protect the interests of members and clients and to promote professionalism, sportsmanship, and conservation in the interests of angling. Jim has a current first aid certificate. A satellite phone is carried on all back-country trips to ensure availability of communication. 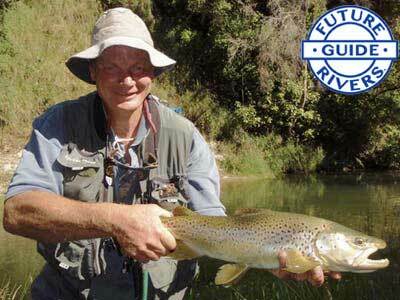 Jim is a qualified Grade 3 river guide and has rafted these rivers extensively for over 15 years.